There's a whole world of "serious games" out there, and Crytek has a secret studio set up to tap into it. With six studios around the world, Crytek is surprisingly large for a company that has only released three games in ten years. That's because not all of its revenue comes from making games, or at least, not the games that end up on shelves for people to buy. Crytek also makes money with what CEO Cevat Yerli refers to as a "secretive engine business," with a lot of military companies as customers. Yerli says that Crytek actually has seven studios, but that the seventh isn't named Crytek like the others and works solely on non-entertainment projects. Crytek supplies the military with technology, simulations software, training programs and anything else it may want and/or need. 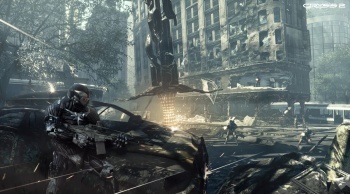 As well as its military contracts, Crytek also works with a number of gas and oil companies, and Yerli says that there's an entire industry around making serious games that runs parallel to entertainment software. Crytek certainly isn't the first games company to provide technology to the military. Games like Full Spectrum Warrior and SWAT 4 have been used as training tools by various forces around the world, and the US Army even produced a game of its own - America's Army - to help with recruitment. All the same, it feels a little strange knowing that while you're playing as a soldier in Crysis 2, somewhere in the world a real solider is training on the game's distant cousin.